Thinkers, Rebels & Our World! What is an "Adult Child"
-- All faiths or none Welome! Here is Lucky’s “Speak Don’t Spank” 3 minute video that grew out of the Breaking free series. This video won 2nd prize in a contest eschewing spanking and encouraging non- violent parenting. 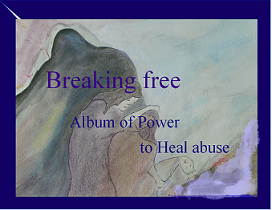 music, emotional “first- aid” and insight to encourage survivors of challenging homes. Here is the YouTube trailer to the video series. It includes traits of family dysfunction and highlights from the full length movies. includes full color artwork from the movie with a more intimate look into the dynamics of family abuse and recovery through the eyes of an emerging survivor. If you enjoy recovery art and the "Breaking Free" videos, you'll love the book with art from the movies in which the tender self is understood, encouraged and kindly nurtured. read more. 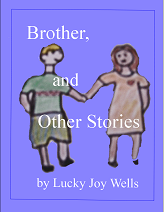 Two sisters offer tribute as they ponder events surrounding the premature death of their brother and his near- fatal accident as a youngster, an event that may have been both an effect of dysfunction as well as additional trauma for an already stressed family. Here’s a bit of sweet comfort as found in the “Breaking Free” video series.
. -------------> Our challenges can truly reveal our greatness. Truth Heals us-- May we all awaken to our true selves. support, meetings, & more ! Your source for ACA needs! thus ACA, AcoA, etc. ("Adult Children" of Alcoholics) monikers came into being. All faiths & ways, or none-- for Ourselves and Our World !